It’s official – Mum bloggers love The Life Tree! At team Life Tree we are very passionate about our lovely picture and we want as many people as possible to see it, because to see The Life Tree is to love The Life Tree . We sent their very own personalised Life Trees out to a few Mum bloggers whose blogs we follow and love. We wanted to see what they thought of it and whether they adore it as much as we do. A Mum Reviews is a great blog and does what it says on the tin – Petra is a Mum and she reviews things! She also shares great hints and tips from her own experiences with children. 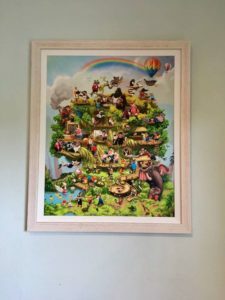 A Mum Reviews had her Life Tree personalised with the words I Love You as it is for both her daughters ( as well as any new family additions who may appear in the future!) Check out what A Mum Reviews thinks of The Life Tree and watch her vlog too. Here at Life Tree HQ we follow another Mum blogger – Jenni, through her blog Chilling with Lucas. We read about their adventures with avid interest – Chilling with Lucas diarises life as a Mum – giving great tips for days out, things to do with a little one and generally interesting stuff that pops into Jenni’s head. We adore catching up with Chilling with Lucas and their exploits. So we were thrilled to be able to send a Life Tree to Jenni personalised with, surprise, surprise the name Lucas! See what Jenni had to say about The Life Tree here. We are also running a giveaway of the books of the Verses of Wisdom through Chilling with Lucas. There is still time to enter to win one of the ten books available – Good luck! White cotton peonies is a fabulous blog written by Mel who is Mum to the gorgeous Arabella. Like Chilling with Lucas, White Cotton Peonies shares experiences of being a first time Mum. It is fair to say that both Mel and Arabella (Bells) have fallen in love with The Life Tree. Rumour has it that one or two tears were shed by Mel when she received her Life Tree and read the Verses of Wisdom! Read her thoughts about The Life Tree here. We are delighted that all these lovely Mum bloggers were charmed by The Life Tree. 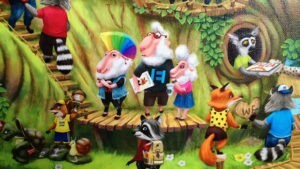 It is always reassuring to know that the magic which we see in The Life Tree is shared by other people. Thank you Petra, Jenni and Mel.